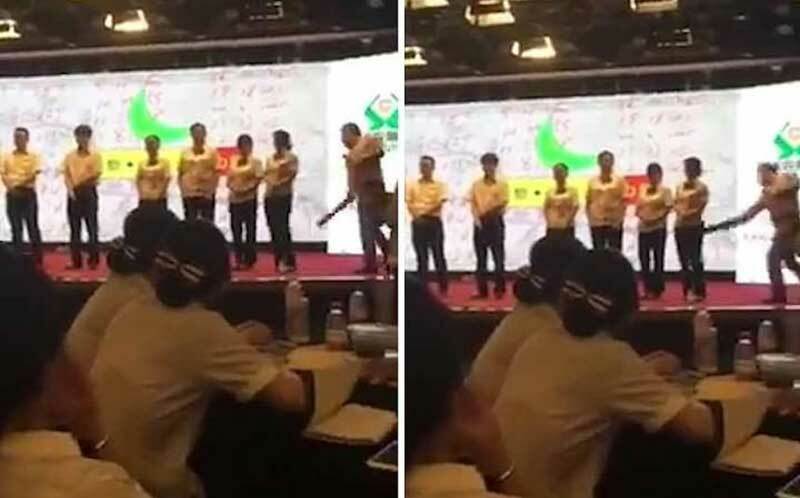 A motivational trainer in China spanked eight rural bank employees with a stick, shaved the heads of the men and cut the hair of the women after they performed poorly on a training weekend. “Spanking was a training model I have been exploring for many years,” the trainer, Jiang Yang, said, absolving the bank’s leadership of direct responsibility. Changzhi Zhangze Rural Commercial Bank, a lender in northern Shanxi province, hired a Shanghai-based training company to run a “performance breakthrough” course. After a day of training last weekend for a staff of more than 200, Jiang demanded explanations from the eight employees with the lowest scores. One responded: “I’m not hard on myself.” Another shouted: “I didn’t make a breakthrough”, while a third blamed lack of teamwork. Jiang then asked them to prepare to be beaten and strode up and down the row of offenders several times, spanking them hard with a stick. Later, he cut the women’s hair and shaved the men’s heads. The punishment, was captured by a mobile phone. YouTube link. Alternative Facebook link. The training company declined requests for comment, while telephone calls to the bank went unanswered and Jiang’s mobile phone appeared to have been switched off. In a statement on Monday, a banking oversight body described the training as “improper”, adding that it had suspended the bank’s chairman and a deputy governor and told Jiang to make a public apology. I bet that lifted company morale.